It goes without saying – with this much history, there are bound to be some skeletons in the closet (maybe even literally!) Read on to discover some of Prescott's most haunted digs. Forever one of my favorite buildings in Prescott, legend has it that the crude “gargoyles” that leer down on people passing on the sidewalk each depict local politicians of the era. Where is it? The hotel is located in the heart of downtown Prescott, right at the north edge of Whiskey Row. The official address is 205 West Gurley Street. What's the story? The story of this hotel starts with being built on the site of another hotel, Hotel Burke, after the original burned to the ground. Though there is no history of anyone passing away within the walls, there have been plenty of stories from guests who claim they've felt a presence. How haunted is it? As best I can tell, not very. If you're interested in a semi-scary evening, but you're not really into being terrified, stay here. 3 chills out of 10. Built in 1917, the story of the ghost who allegedly haunts the Hotel Vendome is a most tragic one. What's the story? Though the Hotel Vendome has had many owners throughout the years, one in particular insists on hanging around. Legend has it that a young girl named Abby moved to the Prescott area for treatment of tuberculosis. After meeting her husband, the two purchased the Hotel Vendome. When they lost the hotel for financial reasons, the new owners agreed to let them stay in Room 16. One night, Mr. Byr left in order to get medication for Abby – and never returned. A heartbroken Abby refused to eat and eventually passed away in the room, along with her cat. How haunted is it? By my completely unscientific research, I would give this 7 chills out of 10. The fact that Mrs. Byr passed away in the room definitely adds something to the validity of the claims. Built in the 1880s, this brick building was initially a Catholic church. It is now the Prescott Fine Arts Theater. Where is it? The theater is located at 208 North Marina in Prescott. What's the story? When Father Edmond Clossen passed away, he requested that his remains be buried under the altar of the church. However in the 1960s, when the church was sold and an attempt was made to exhume his body – he was gone. If they somehow miscalculated where his body was located, he is still buried under the stage. How haunted is it? In the event Father Clossen is still under the stage, the place may actually be haunted. If there was never any truth to the rumor in the first place, then not very. I give it a 4 out of 10 – I'll give rumor-starters the benefit of the doubt, just for fun. There's something about those men in the early 1900s leaving their wives in the middle of the night, never to return. Where is it? 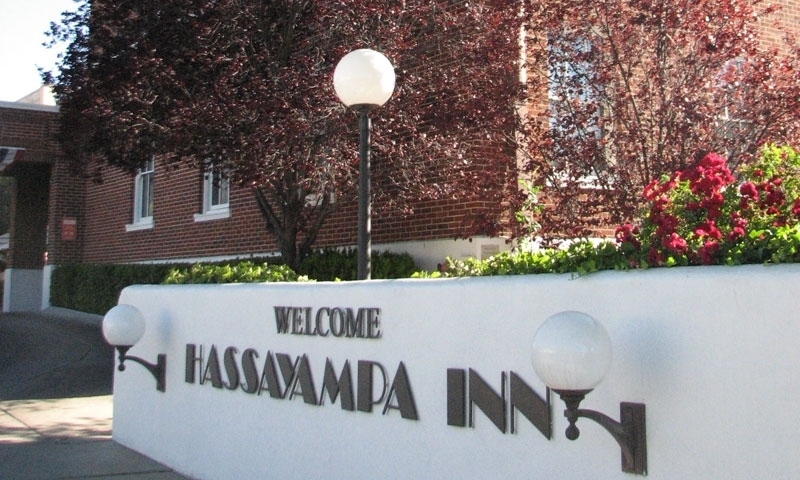 The Hassayampa Inn is located at 122 East Gurley Street. What's the story? Rumor has it that in 1927, Faith Summers and her brand-new husband checked into the balcony suite of the hotel to celebrate their honeymoon. Again, the husband stepped out (in this case, for cigarettes) and never returned. For three days, Faith allegedly, well…had faith. But finally she lost it, hanging herself off the bell tower above her honeymoon suite. How haunted is it? If there is any truth to this story, it is a hard one. You almost hope that it's completely fabricated. But in the event it is not, I'll give this an 8 chills out of 10.